I made this Panda bear cake for the mother of a friend of mine. She was in a nursing home and not doing very well healthwise. This was such a fun and easy cake to make for such a precious, loving lady. The cake was made with the Wilton bear 3-D pan. I tinted chocolate buttercream with black coloring. The chocolate frosting base gives you a deeper and more true “black” color. Then, I used the grass tip to cover the whole bear with “hair”. 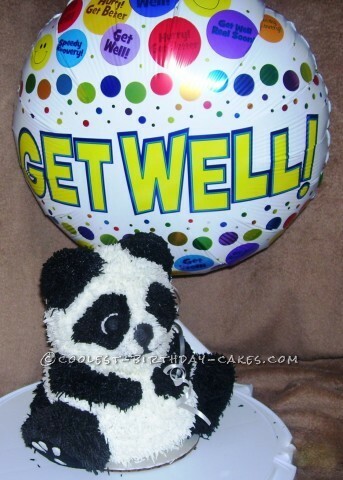 The balloon was placed in the bear’s paw and held in place with icing. The look on my friend’s mother’s face when we walked in and gave her this cake was touching and priceless!